On the morning of October 26, midnorthern viewers can look for Mercury and the Moon rising before the Sun, less than a handsbreadth apart. This story was updated at 12:29 p.m. EDT. If there ever was a planet that has gotten a bad rap for itsinability to be readily observed, it would have to be Mercury, known in somecircles as the "elusive planet." ". . . is hardly evervisible when it is truly dark. Mercury . . . will be seen only near the horizonin dawn or twilight, amid haze and sun glare. I suspect, in fact, that manypeople today (when the horizon is dirtier and the sky much hazier with theglare of artificial light than it was in centuries past) have never seenMercury." Nonetheless, during these next three weeks we will bepresented with an excellent opportunity to viewMercury in the early morning dawn sky. Mercury is called an "inferiorplanet" because its orbit is nearer to the sun than the Earth's.Therefore, it always appears from our vantage point (as Asimov indicated) to bein the same general direction as the sun. In old Roman legends, Mercury was the swift-footedmessenger of the gods. The planet is well named for it is the closestplanet to the sun and the swiftest of the sun's family, averaging about 30miles per second; making its yearly journey in only 88 Earth days.Interestingly, the time it takes Mercury to rotate once on its axis is 59 days,so that all parts of its surface experience periods of intense heat and extremecold. Although its mean distance from the sun is only 36 million miles,Mercury experiences by far the greatest range of temperatures: nearly 900degrees Fahrenheit on its day side, -300 degrees on its night side. In the pre-Christian era, this planet actually had twonames, as it was not realized it could alternately appear on one side of thesun and then the other. Mercury was called Mercury when in the evening sky, butwas known as Apollo when it appeared in the morning. It is said thatPythagoras, about the fifth century B.C., pointed out that they were one andthe same. Mercury possesses the most eccentric orbit of any planetexcept Pluto. At its farthest distance from the sun (aphelion), it lies about43 million miles away. But when it arrives at its closest point to the sun(perihelion) it's just less than 29 million miles away. So its angular velocitythrough space is appreciably greater at perihelion. Interestingly, Mercuryrotates on its axis three times for every two revolutions it makes around thesun. But at perihelion (Oct. 17) Mercury's orbital velocity will briefly exceedits rotational speed. As a consequence, a hypothetical observer standing onMercury would see a sight unique in our entire solar system. Over the course ofeight days (fours days before perihelion to four days after perihelion), thesun will appear to reverse its course across the sky, then double back andresume its normal track across the sky. If an astronaut were located on thatpart of Mercury where the sun were to rise around the time of perihelion, thesun would appear to partially come up above the eastern horizon, pause and thendrop back below the horizon, followed in rapid succession by a second sunrise! Mercury rises before the sunall of this month and is surprisingly easy to see from now through Nov. 5. Allyou have to do is just look low above the eastern horizon during morningtwilight, from about 30 to 45 minutes before sunrise for a brightyellowish-orange "star." Mercury will be at its greatest western elongation, 18degrees to the west of the sun, on Oct. 22, rising as dawn breaks. Mercury, like Venus, appears togo through phases like the moon. Shortly after passing inferior conjunction onOct. 6, Mercury was just a slender crescent. Currently, it appears aboutone-third illuminated, but the amount of its surface illuminated by the sunwill continue to increase in the days to come. So although it will begin toturn back toward the sun's vicinity after Oct. 22, it will continue to brightensteadily, which should help keep it in easy view over the following couple ofweeks. Helping to aid in identifying Mercury will be a lovelycrescent moon. 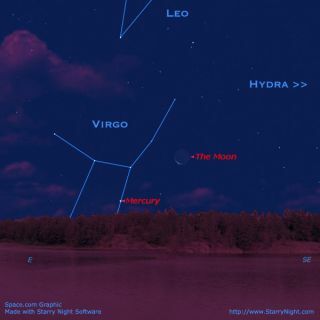 Early on the morning of Oct. 26, at about an hour beforesunrise, you'll find the moon low in the east-southeast sky and Mercury willappear as a bright star-like object well below and to the moon's left. On the following morning (Oct. 27), it will be just adelicately thin sliver, and only about 38 hours from new phase, hovering well offto the lower right of Mercury. Then during the mornings of Oct. 30 and 31,Mercury will slide above and to the left of the bright blue star, Spica, in theconstellation of Virgo. The speedy planet will still be easily visible as late asNov. 5; though appearing nearer to the sun's vicinity in the sky, it will havebrightened to magnitude -0.9. That's brighter than the star Canopus and secondin brightness to Sirius, the brightest star in the night sky. Thereafter, itdrops back down to invisibility, under the dawn horizon.